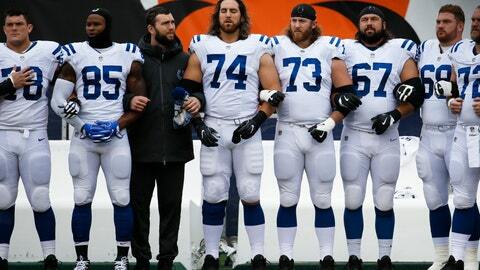 Andrew Luck remains a non-uniformed sideline presence for the Colts. INDIANAPOLIS — Andrew Luck spent Monday out of sight, still recovering from offseason shoulder surgery. But the longer he sits, the more likely it becomes Luck won’t play at all this season — a possibility that was bolstered by the fact Pagano confirmed his starting quarterback would miss a third consecutive week of practice. General manager Chris Ballard told reporters on Oct. 18 that Luck had been “shut down” after receiving a cortisone shot. That has prompted many outsiders to openly debating whether it’s worth playing Luck — even if he can come back this season. The Colts visit Houston (3-4) on Sunday then host Pittsburgh (6-2) before their bye week. An interception return for a touchdown that led to Indy’s loss in Cincinnati has put the Colts 2 games behind AFC South co-leaders Jacksonville and Tennessee.